Barker 42 Gallon 4 Wheel Tote-Along Portable Holding Tank with air filled pneumatic wheels, all the fittings, side discharge dump hose and convenient tow handle you can attach to your truck for stress free dumping! You need a portable honey wagon because you do not want to move your RV just to dump your tanks, or you do not have the option of sewer connections where you are camped – portability is the key! Pulling a loaded holding tank needs to be easy, and convenient. The Barker 42 Gallon 4-Wheeler Tote-Along Portable Holding tank has everything you need to make that trip to the sewer dump station hassle free! The convenient tow handle is specifically made to slip on your tow ball, letting you drive your 42 Gallon Barker Waste Tank to the campsite dump station. You pull or turn the front swivel tow handle will follow. Pulling a storage tank that distance with those old hard wheels can be a real pain. Barker has made their largest tank, the 42 gallon waste tank, with air filled pneumatic tires that glide over those bumps. 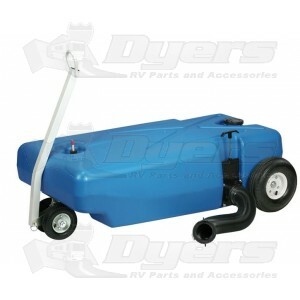 Yes, this Barker 42 Gallon Portable Waste Tank has easy to tow pneumatic wheels! Barker tanks come with a standard 3” valve with side discharge, and all the hook ups and dump adapters you need to dump your waste tank. Convenient bobber gauge pops up to let you know the tank is full. No guessing! Double wheel, front-swivel design for easy pulling and maneuvering. Weight Empty: 38 Lbs. and Full: 374 Lbs. Height of Tank Body: 14"
Height to Fill Cap: 14"
Good product but there is no vent to evacuate the air while filling the tank ! The tank is good quality, and is as advertised. The rubber tires are a big plus. However, the main axle was not attached to the tank! In doing research, this appears to be a common problem. I called manufacturer, and was told I would have to remove push nut (not an easy job), remove wheel, and slide axle thru tank. They promptly sent me replacement push nuts. The outlet air needs to be better designed. Had to drill a hole in the gauge to let the air out. When I received the tote it was everything as described! It is large & heavily constructed. I only used it once because I purchased it at the end of the season, but am looking forward to using it next season!! If all Dyer's products are true to what they advertise, I highly recommend them!